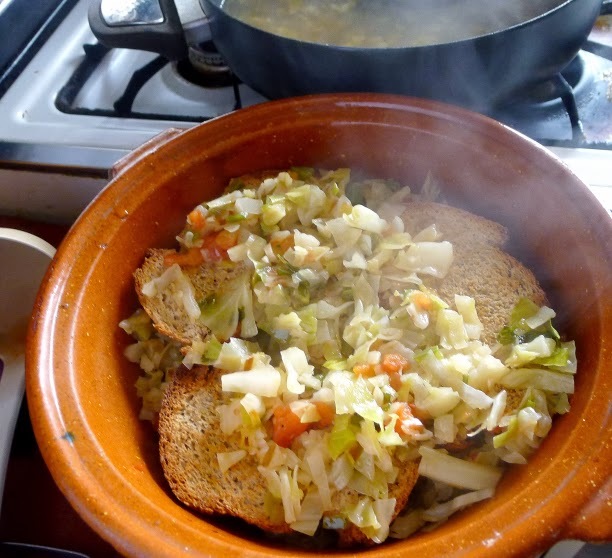 Hearty cabbage soup for a chill winter's day. Lurking in the fridge was half a cabbage, waiting for inspiration. 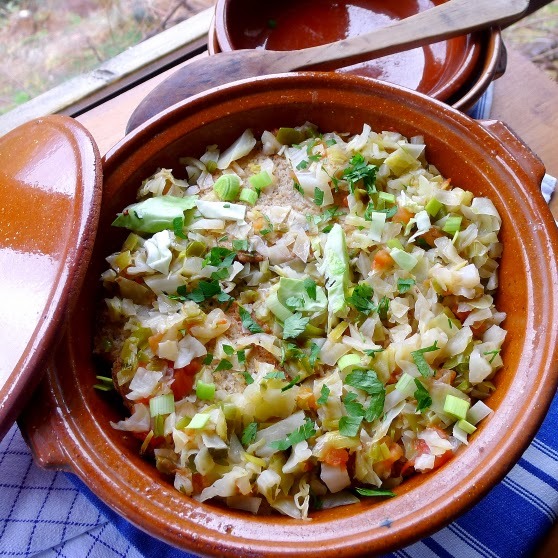 When cold, drizzling rain sent me searching through my soup recipes for something warming, I came upon an entry for “dry” soup with cabbage, a specialty of Mallorca (Balearic Islands). Inspiration! “Dry” soup? Because bread is added to soak up all the tasty broth. The word “soup” derives from “sop,” after all. Sopa, in Spanish, comes from the same root--pieces of bread soaked in broth. The simple version of this soup is completely vegan. The flavor comes from olive oil and vegetables—no stock is required. However, it can be embellished with scraps of fried ham or a poached egg on top for each person. Ladle bread, vegetables and liquid into individual soup bowls. 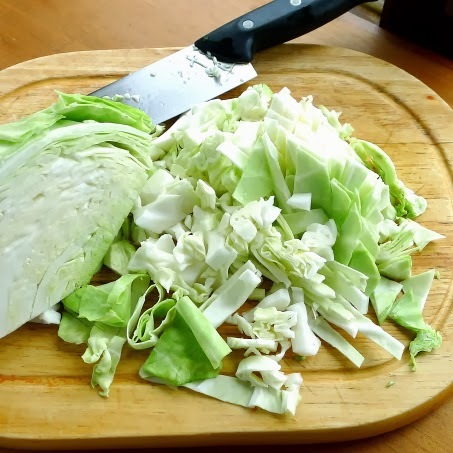 Other vegetables—cauliflower, chard, carrots, spinach, kale—can be used instead of or in addition to the cabbage. Preheat oven to 350ºF. Place the bread on a baking sheet and brush with 1 tablespoon of the oil. Toast in the oven, turning once, until browned on both sides, about 12 minutes. Heat the remaining oil in a deep pan and sauté the chopped leeks, onion and green pepper until soft. Add the tomatoes and garlic and cook a few minutes more, then add red pepper flakes, parsley and chopped cabbage. Season with salt and pepper, add 4 cups of water, bring to a boil, then cover and simmer until vegetables are tender, about 30 minutes. Layer the bread, vegetables and broth. Place a layer of toasted bread in a large cazuela. With a slotted spoon or skimmer, add a layer of the cooked vegetables. Cover with another layer of bread, then vegetables, until all have been used. Pour over all the liquid plus enough boiling water to just barely cover the bread and vegetables. Cover the cazuela and let stand for 15 minutes, until the liquid is absorbed. Ladle the bread, vegetables and liquid into individual bowls. Serve hot or room temperature. I enjoyed the soup, the second-time around, reheated in the oven with sliced cheese on top. Prepare your spoons! Stew with chickpeas, chard and sausages. 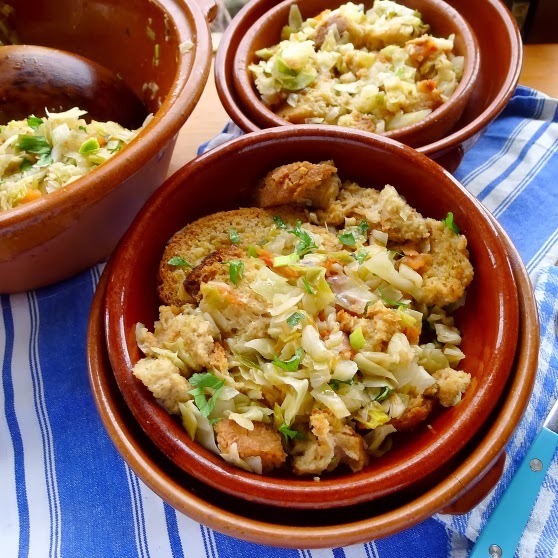 Tuck your napkin under your chin and get your spoons at the ready because we’re off on the “spoon trail.” The comida de cuchara—a meal eaten with a spoon—is favorite fare in Spain, especially in blustery winter weather. In today’s high-powered world, even well-heeled businessmen and politicos have a weakness for comforting bowls of spoon food—lentils like mamá used to make or abuela’s potaje. 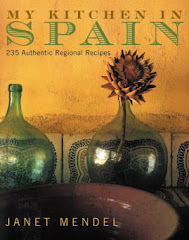 So, when a visiting friend, Lars Kronmark, who is a chef-instructor of culinary arts at the Culinary Institute of America (CIA) at Greystone in Napa Valley, California, said he wanted to taste some typical Spanish soups, I looked to village bar-restaurants for traditional dishes. 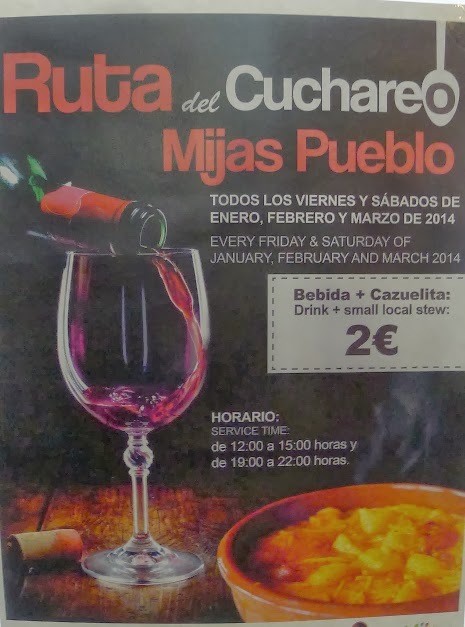 During January, February and March, every Friday and Saturday in my town, Mijas Pueblo, a dozen bars are participating in the Ruta del Cuchareo, or “route of the spoon,” offering a cazuelita (earthenware ramekin) of soup or stew plus a glass of wine for just €2 (about $2.70). We weren’t going from bar to bar, so I chose one, El Refugio (www.barelrefugio.es), for a spoon-food tasting menu for six persons. We had several salads and tapas as starters, then sampled three different soups/stews. Lars serves a bowl of berza. Are they soups or stews? I had trouble deciding what to call them when I was writing recipes for my cookbooks. Most have either legumes, such as chickpeas or beans, or rice. Some are really soupy, others fairly thick. In Spanish, the word potaje covers this category nicely. But “pottage” in English doesn’t sound so enticing. 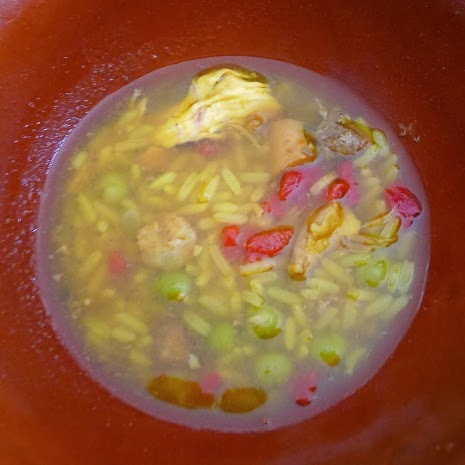 Cazuela de arroz—rice with chicken, fish and shrimp—is sort of a “paella soup.” Carlos Boeta, owner of the Bar El Refugio, told us that making a flavorful fondo, or stock, is the most important part. 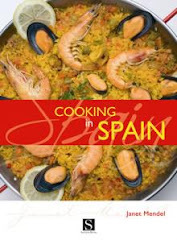 My recipe for cazuela de arroz makes a rice dish not so soupy as the one shown here. 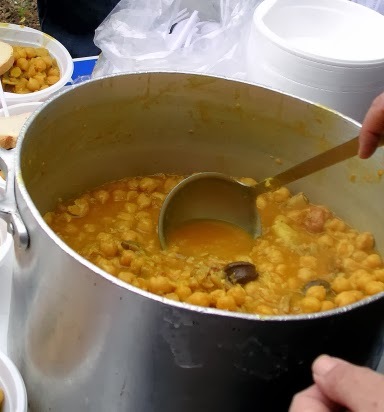 Because this week is the día de San Antón, the festival of St. Anthony Abbot, patron of pigs and other animals, we had to sample the typical feast-day food, potaje de callos, chickpeas, pig tripe, trotter and sausages. That recipe as well as some photos of the fiesta, when locals bring their pets to be blessed by the priest, is here . Chickpeas, pig tripe and sausages for San Antón day. 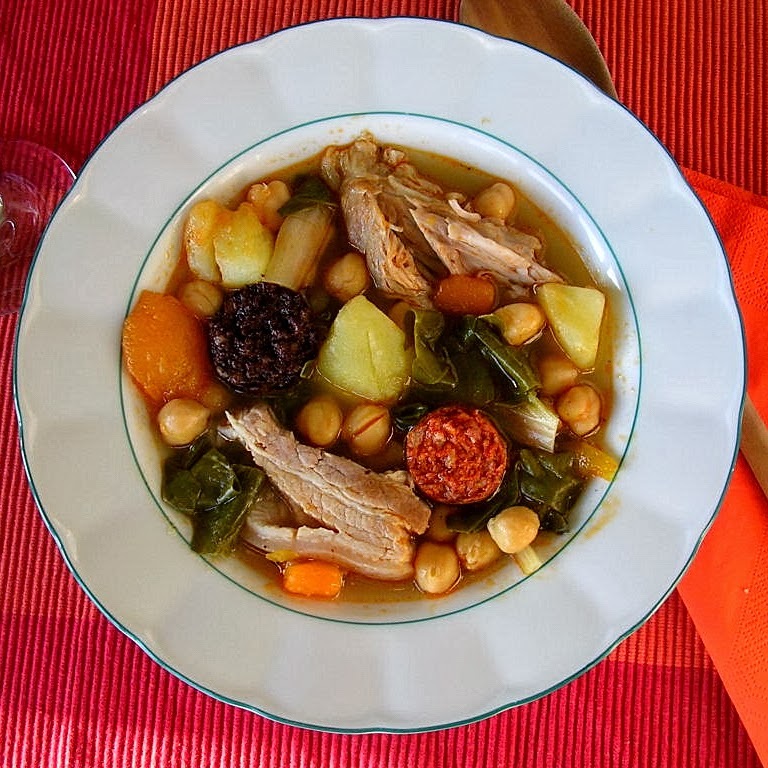 And, possibly my favorite soup/stew of all—berza de acelga, an Andalusian vegetable stew chock full of chickpeas, meat, sausages, chard and other vegetables. The version served at El Refugio, made by the cook, Rocio, is soupier than my version, pictured at the top. 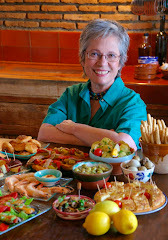 I wrote about berza on an earlier blog post http://mykitcheninspain.blogspot.com.es/2011/03/carnaval-pre-lenten-pig-out.html. Here is that recipe. 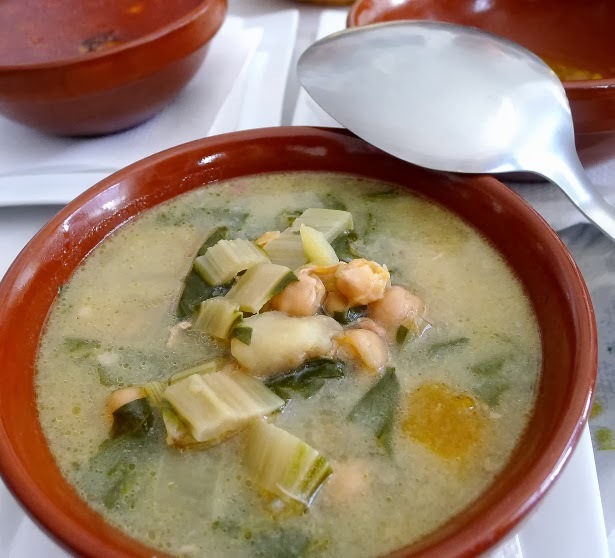 Berza, with chickpeas and chard, at Bar El Refugio, Mijas. Morcilla, blood sausage, and chorizo punch up the flavor in this vegetable stew. If you don’t have morcilla, add a pinch of clove, a spoonful of pimentón (paprika) and crushed garlic to the vegetable pot. Drain the chickpeas. 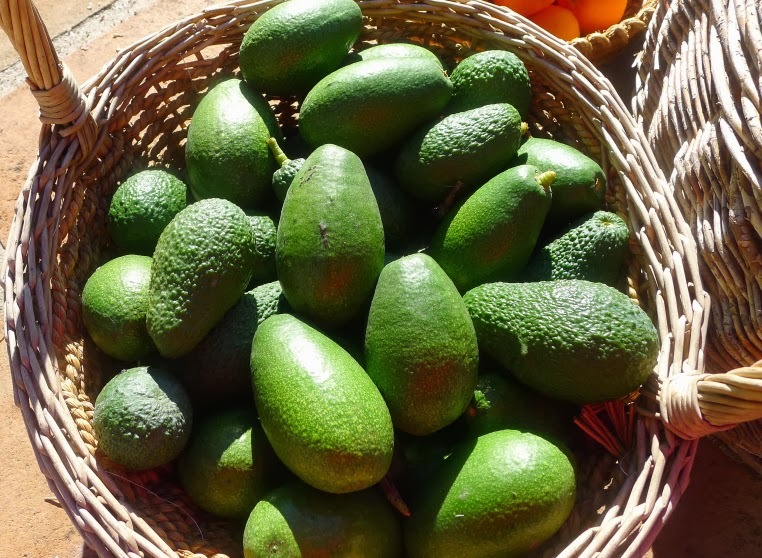 Put them in a large soup pot with 8 cups of hot water. Bring to a boil and skim off froth. Add the beef, pork rib and ham bone, if using. When water boils, skim again. Reduce heat, cover and simmer for 1 hour. Chop the chard. Add to the pot with the carrot and pumpkin. Prick the morcilla several times with a skewer (so it doesn’t pop open when steam accumulates) and add it to the pot. Add the peppercorns and salt. Cover and simmer 20 minutes more. Add the potatoes. Cook 20 minutes more. Remove several chunks of potatoes and pumpkin and mash them smooth. Stir the mash into the pot to thicken the broth. Let the stew settle 10 minutes before serving. Cut beef, pork rib, and sausage into pieces. Serve the chickpeas, meats, vegetables and broth in shallow soup dishes. Migas for breakfast. Or lunch or supper. It’s Number 28 on The Saveur 100 list of top food items in the past year (a list that had shockingly few Spanish entries). Migas, means “crumbs,” as in bread crumbs. 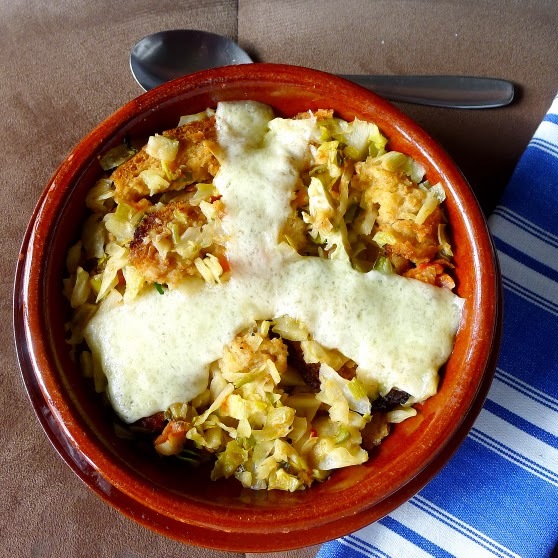 It’s one of those rustic peasant dishes in Spain that is so delicious that you don’t have to be a peasant to love it. Migas is especially good when made outdoors on a woodfire. 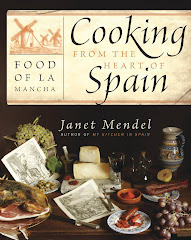 Cooked in a deep skillet, it feeds a hungry crowd—grapepickers at the vendimia or, this time of year, sausage-makers at a matanza, hog butchering. Everybody gathers round and eats straight from the pan. 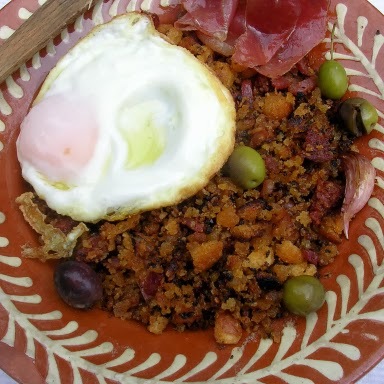 Migas garnished with fried egg, pepper, chorizo and raisins. 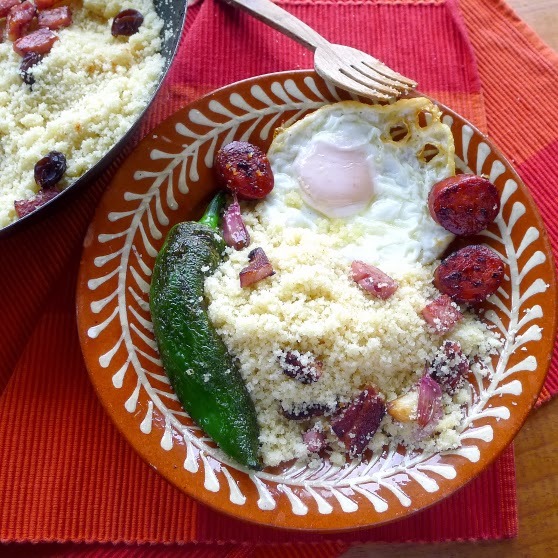 Migas allows just about any garnish or embellishment you might dream up. Fried chorizo sausage, pork loin, fried green peppers, fried egg, canned or fried sardines, olives. 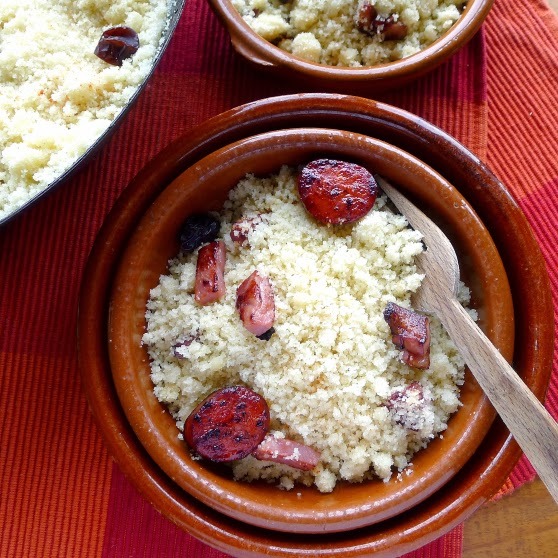 Migas de matanza—served at a pig slaughtering—would include chopped pig’s liver along with scraps of pork belly. In the late summer, sweet grapes or pieces of melon accompany migas; in winter, raisins add the sweetness that contrasts so nicely with the slightly salty, fatty migas. 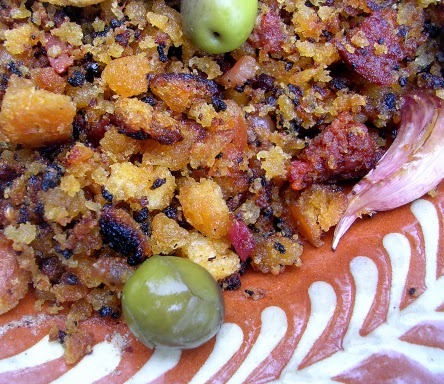 Usually migas is made with stale bread, broken into bits, dampened with water, then fried with olive oil and ham fat. (Mexican migas is made with broken bits of corn tortillas.) 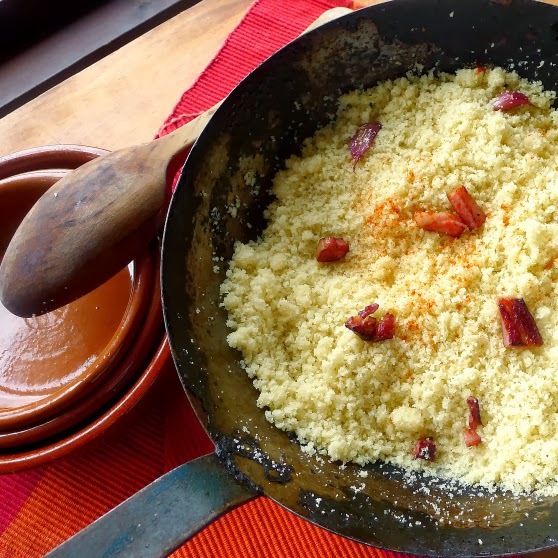 This version is different—made with wheat semolina that cooks up somewhat like cous cous or grits. Like grits, migas is equally good with eggs for breakfast or as a side with meat and gravy for dinner. Bacon bits and fried chorizo garnish the migas. Cut the bacon into dice and fry it in a skillet until crisped and brown. Skim it out and reserve. Use the side of a knife to lightly crush the unpeeled garlic. Add the oil to the skillet with remaining bacon fat. Add the whole garlic. When they begin to brown, remove the pan from the heat and stir in the pimentón. Very carefully add the water and salt. Return the skillet to the heat and bring the water to a boil. 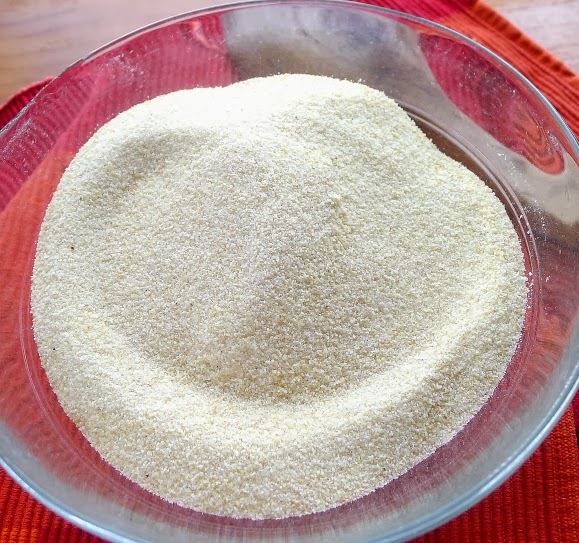 Use a wooden spoon or fork to stir in the semolina. Cook on a low heat, stirring frequently, until the semolina absorbs all the water and oil and becomes soft and fluffy, about 10 minutes. Fork it through to break up any lumps and separate the grains. Serve the migas topped with the reserved fried bacon. 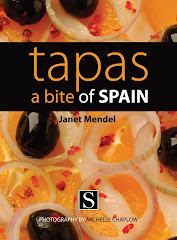 Garnish as desired with fried chorizo, raisins or grapes, fried peppers, eggs or sardines. Use dense, fine-textured country bread, two-days old. If this is not available, use a compact loaf of Italian-style bread, without texturizers or preservatives. How much bread you need depends on the shape of the loaf, so the measurements are given by weight. Serves 4 as a side dish or 2 as a main breakfast dish. Cut the bread into ½ -inch dice. You should have about 5 cups of diced bread. Place the bread in a bowl and sprinkle with ½ cup of water. Toss the bread bits until they are dampened, but not soaked. Place them on a dampened kitchen towel and wrap them tightly. Leave to stand overnight (or at least 6 hours). 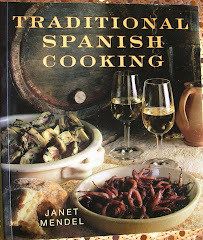 Heat the oil in a deep skillet or earthenware cazuela. Fry the pieces of garlic and strips of bacon until lightly browned, then skim them out and reserve. Add the bread bits to the fat. Fry the crumbs on a medium heat, turning them constantly with a spatula. At first they tend to stick to the skillet. Keep stirring until they are loose and lightly toasted, about 20 minutes. 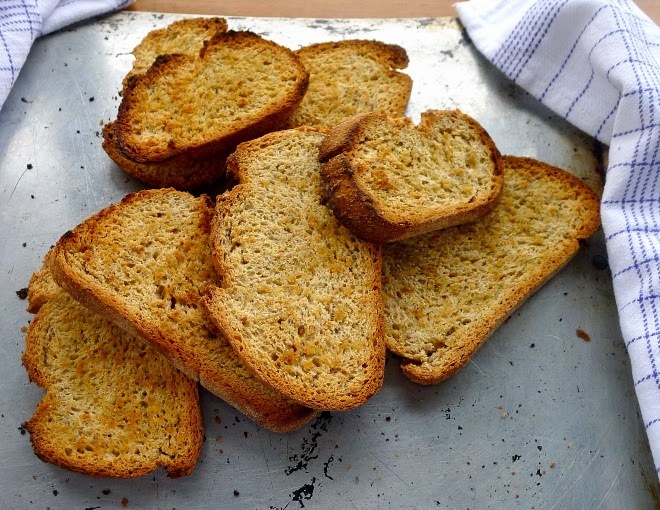 Keep cutting the bread with the edge of the spatula to gradually reduce the dice into crumbs. Stir in the salt, paprika, cumin, cloves and pepper. Return the fried garlic and bacon to the pan and give everything another few turns. The bread crumbs should be slightly crunchy, not crisp. Choose any two of the accompaniments to serve with the migas. STUFF A CHICKEN RIGHT NOW! Roast stuffed chicken makes any meal special. I haven’t made a stuffed turkey for more than two years! With fewer people at my holiday table, it just doesn’t make sense to roast a big bird. But, I’ve been missing the pleasure—the wonderful smell of a stuffed bird while it’s in the oven and the anticipation of a lovely meal to come. And stuffing (or, maybe you call it dressing)--sage, onion and celery; mushroom-thyme, or apple and sausage--stuffing is a big part of the delight. So, why wait for another holiday? Stuff a chicken right now! For Sunday dinner, when you have time to enjoy the slow-roasting and the aroma that fills the house with a celebratory feel. Even if you are only two or three or four, the leftovers are gratifying. 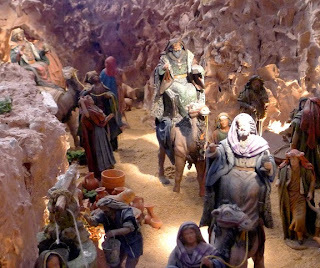 Three Kings, from a village Nativity scene. 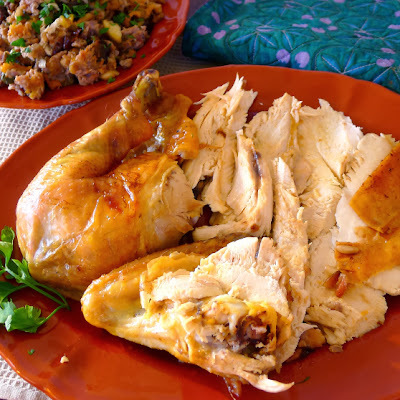 In Spain at Christmas (which, by the way, is not over yet, as 12th night and the holiday of Epiphany—Kings Day, when kiddies get their gifts from the Three Kings from Bethlehem is January 6), a favorite item is boned chicken with a stuffing of ground pork and ham. Boned chicken is easy to serve. Pork stuffing with dried fruits. 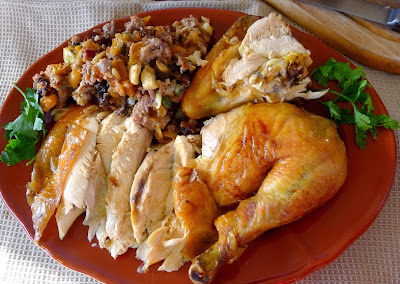 I’ve used a Catalan version of that stuffing, with dried fruits and nuts, to stuff a whole, bone-in chicken. I look for a good-sized bird—at least 5 pounds—either free-range or organic. The free-range chickens I get are fairly lean but have great flavor and texture. The pork stuffing helps to baste them from the inside out. A medium-dry Sherry adds subtle background flavor to the stuffing and the pan juices. If not available, use any white wine. Use any combination of dried fruits. 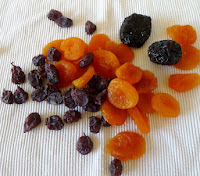 I favored apricots, Málaga raisins* and prunes. If they are very dry and leathery, soak them in hot water for 30 minutes, then drain and add to the stuffing. You can substitute pork sausage meat for the ground pork—but don’t add additional salt to the stuffing. Truffle is an optional, luxurious, addition to the stuffing mixture. Lard can be substituted for olive oil, if desired. Small onions, carrots, potatoes, turnips can be added to the roasting pan, if desired. *Málaga muscatel raisins, shown in the photo, are the sweetest in the world. They do, however, have seeds.Worth the trouble of de-seeding them. Dried fruits go into stuffing. Sprinkle the chicken inside and out with salt and pepper. Add 1 tablespoon of the Sherry to the cavity. Allow the chicken to come to room temperature. Combine the pork, ham and dried fruits in a bowl with ¼ cup Sherry. Heat 1 tablespoon oil in a small skillet and toast the pine nuts until golden. Skim them out. Add the onions to the skillet and sauté on medium heat until softened, 3 minutes. Add the onions to the meat with the pine nuts, bread crumbs, apple, pimentón, cinnamon, cloves, nutmeg, parsley, truffles and capers, if using, 1 teaspoon salt and freshly ground black pepper. Combine well. 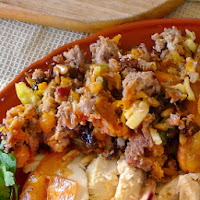 Stuff the chicken with the mixture of meat and dried fruits. 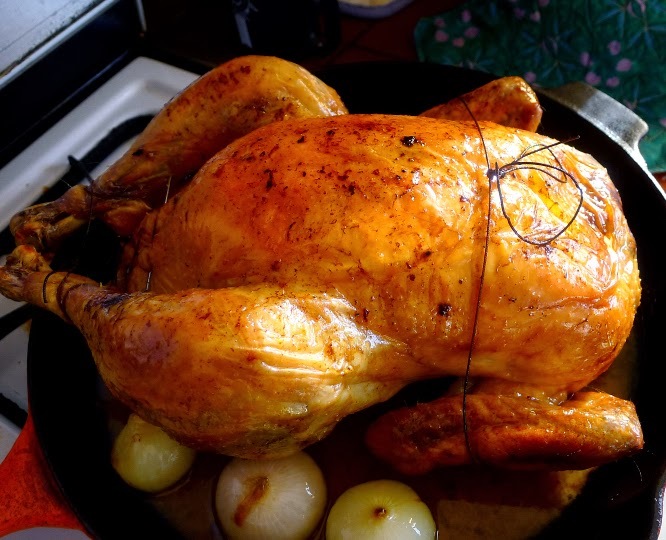 Skewer the neck and body openings closed and truss the chicken with kitchen twine. Place in a heavy roasting pan or in a large skillet. Drizzle with 1 tablespoon olive oil. Roast the chicken for 40 minutes. Add ½ cup Sherry and ½ cup chicken stock to the roasting pan. Spoon some of the juices over the chicken. Roast 40 minutes more, basting occasionally. Add ¼ cup additional Sherry and more stock, if needed. Roast 20 minutes more or until internal temperature of the stuffing reaches 140ºF when tested with an instant-read thermometer. Remove the chicken to a cutting board and allow to rest at least 10 minutes. Carve the chicken and scoop the stuffing into a serving bowl. Skim the fat off the remaining pan juices. Spoon some of the juices over the chicken and serve the rest in a bowl. 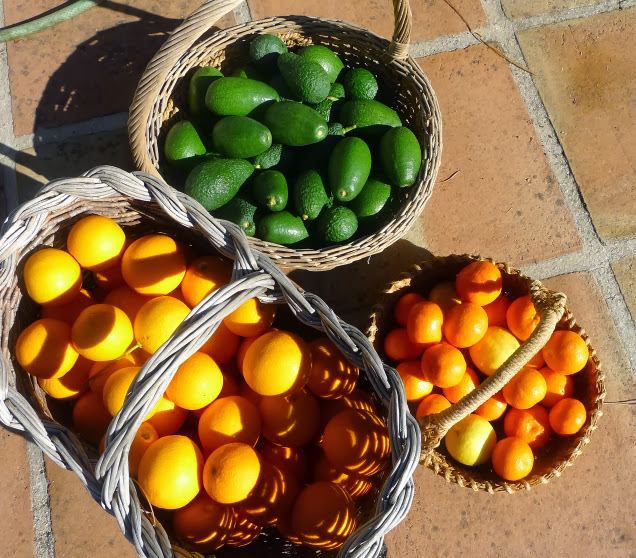 It's only the first day of the New Year and already I have good fortune--baskets of wonderful fruit from a friend's farm--oranges, avocados and clementines--plus gorgeous sunshine. And I've already started on at least one of my New Year's resolutions--to wash the windows so that wonderful sun can shine in and warm my kitchen and dining room. The black-eyed peas are simmering with pork and greens. It's just about sunset and time to light a fire in the fireplace. Time to put behind me the last week of 2013. On Christmas day, a night of rain and high winds brought a mimosa tree down blocking the driveway. Ben spent the afternoon cutting it up and hauling away. Then, marauding goats destroyed my vegetable garden and led Ben on a merry chase round and round the pool. I think the goatherd had had too many holiday brandies, cause he was totally out of control of his herd. He even left one goat behind. She moseyed around grazing and, at nightfall, bumped at the door as if she wanted in. Ben called her the "Christmas Goat." Leo named her "Gassy." I called her "Scape" and played around with the phrase, "Milk her for all she's worth." But, I've never milked a goat. I've got another resolution--to redesign the blog. Needs some freshening up, I think. We shall see if I manage to follow through on that one. Hope your New Year brings good fortune, good food and sunshine.